Before Nest made cameras, home security systems, or smoke detectors, there was the Nest Thermostat. There wasn't anything like the OG Nest when it launched back in 2011, but the market for smart thermostats has heated up since then. 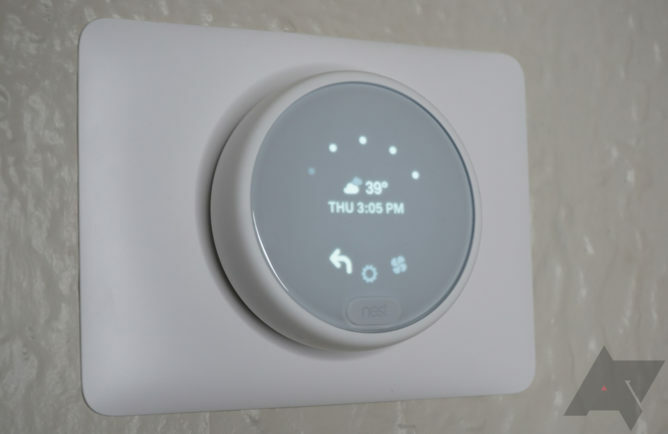 Nest (now an Alphabet company along with Google) has continued iterating the thermostat, which remains its most iconic product. All three generations of the Nest Thermostat have a similar vibe—they look like pieces of technology attached to your wall. Not everyone wants that, but the new Nest Thermostat E offers a more understated look and a lower price. This device can be yours for $169, a full $80 less than the third-generation Nest. It packs almost all the features of its more expensive sibling, but it won't work with as many homes. 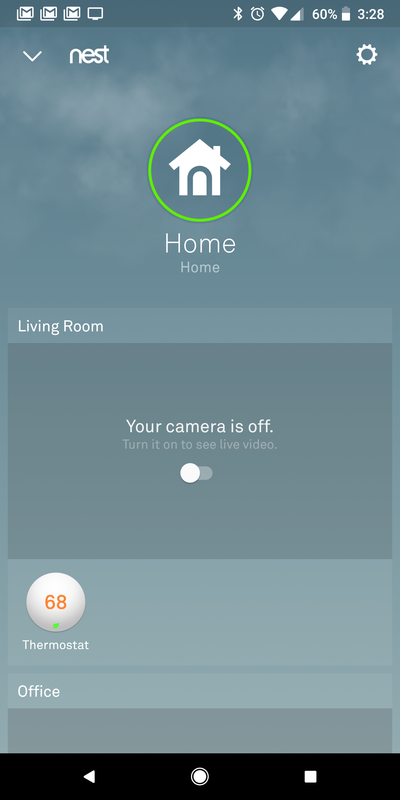 However, it uses the same great Nest app, and the company has nailed smart home integration with Assistant. 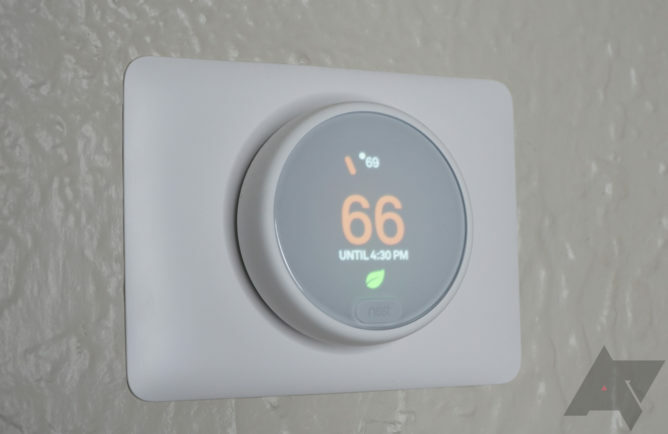 If you need to replace your thermostat, it seems kind of silly not to get the Thermostat E.
Design Clean, understated look that will blend in with most homes. The frosted display looks neat. App The Nest app is much better than what you get from other smart home companies. Assistant Full Assistant integration that's easy to set up. Scheduling Nest's smart scheduling features picked up on my habits in just a few days. Installation If I can install it, anyone can. Price $170 for the Thermostat E is a bargain. Design again The Thermostat E doesn't look as fancy as the third-generation Nest. Wiring Doesn't support as many wiring configurations as the third-generation Nest. UI The simpler display doesn't support the Farsight feature. I wouldn't consider myself particularly handy around the house, but I wanted to see just how easy the Thermostat E would be to install. 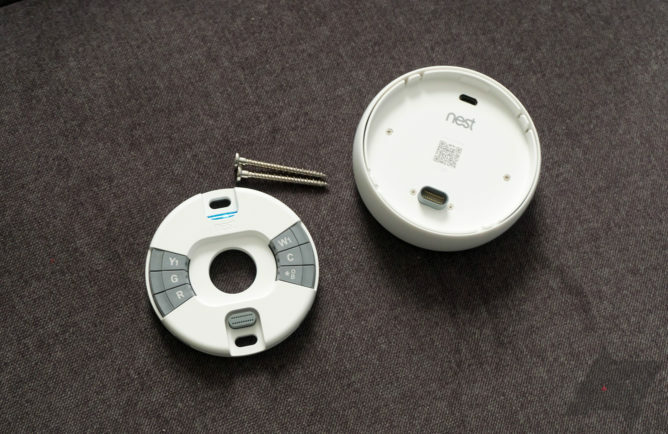 After all, Nest includes instructions, diagrams, and some little wire stickers to help you do it. So, I pulled the old thermostat out of the wall (after shutting off the system) and started fiddling with the wires to see if I could get the Nest Thermostat E up and running. The third-generation Nest has ten wire inputs to account for basically every possible heating and cooling configuration. The Thermostat E only has six, which should be sufficient to connect more than four out of five homes. It's mostly older configurations that won't work with the E. In my case, I had a pretty standard yellow (AC), green (fan), white (heat), and red (power) wire setup. 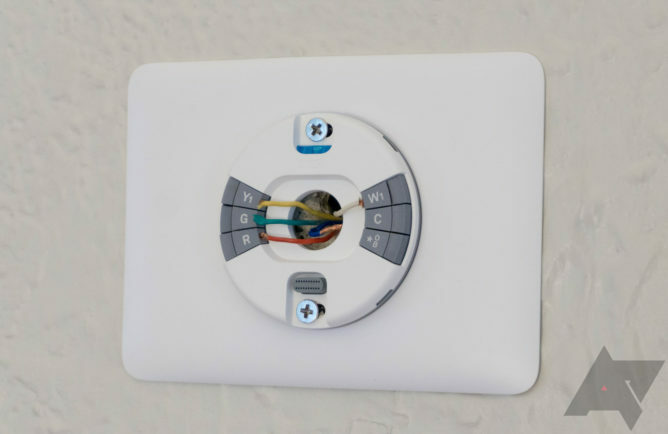 The Thermostat E uses a base plate with wire connections that you mount to the wall by itself. There's a bubble level built into the base, just like the more expensive Nest—a thoughtful feature. It only took a few minutes to drill the holes, mount the base, and plug in the wires. I didn't have what's known as a common wire (usually blue). Those deliver a constant 24v to more greedy thermostats. Nest says you don't need a common wire most of the time, but the third-gen Nest has a reputation for being finicky with just the red wire powering it. The Thermostat E has run just fine without a common wire, maintaining a battery charge of around 3.9v (you need at least 3.7v for full functionality). The Thermostat E itself just drops into the base after you've got all the wires plugged in. When I connected mine, the system booted up immediately and asked a few questions about the heating and cooling system. Next was configuring the app and WiFi network. Finally, the thermostat went through a full test of the system, flipping on the heat, cooling, and fan. In my case, everything went perfectly. Yeah, I was as surprised, too. The Thermostat E has a white plastic housing, whereas the third-generation Nest is metal. It doesn't look as "premium" as the more expensive version, but it doesn't look cheap, either. The front of the Thermostat E lacks the full-color round LCD of the regular Nest—it's a frosted plastic panel with UI elements shining through from behind. This is the most significant design change, but I can see some people actually preferring it. The regular Nest lights up and looks like a piece of technology that is foreign to your home. The Thermostat E's frosted plastic panel is warm and less overtly gadget-y. There's an LCD panel behind the frosted panel, but Nest pared back the interface it displays to offer a more minimalist look. There aren't a bunch of tick marks on the temperature readout, and the device doesn't display as much data when it wakes up. The loss of "Farsight" is the main consequence of the simpler UI. The regular Nest Thermostat can display a clock, weather, or other content when it sees you approach. None of that works on the Thermostat E. It's not a deal breaker, but anyone who has become accustomed to Farsight will probably see the E as a downgrade. This is about as much as you'll ever see on the display. The Thermostat E remains asleep most of the time, looking like an understated white dome on your wall. The display wakes up when it detects movement, though. All it shows is the current temperature, set temperature, and some basic info like how long until a scheduled temperature change. I've grown quite fond of the clean, no-nonsense look of this display. 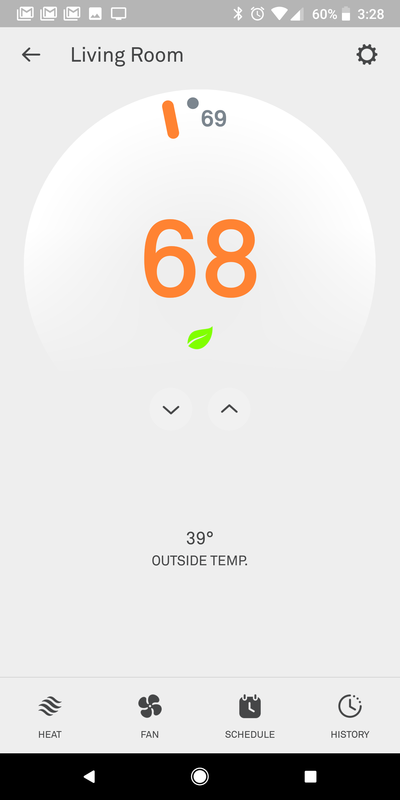 You can control the Nest via the app or from Google Assistant (more on that later), but the Nest still works as a thermostat on its own as well. The entire body spins, letting you adjust the temperature. It can also be depressed like a button to open up the settings and select items in the menu. It works, but it's clunky to do anything other than change the temperature on the thermostat itself. Using the app is far easier. The Nest isn't just a thermostat—it's a learning thermostat. At least, that's what the company calls these things. After setting up the Thermostat E, you have the option of creating a manual temperature routine or letting Nest do it intelligently. This obviously works best with the app installed on your phone, which lets the system know when you're home and when you leave for the day. My situation is somewhat unusual because I work from home. 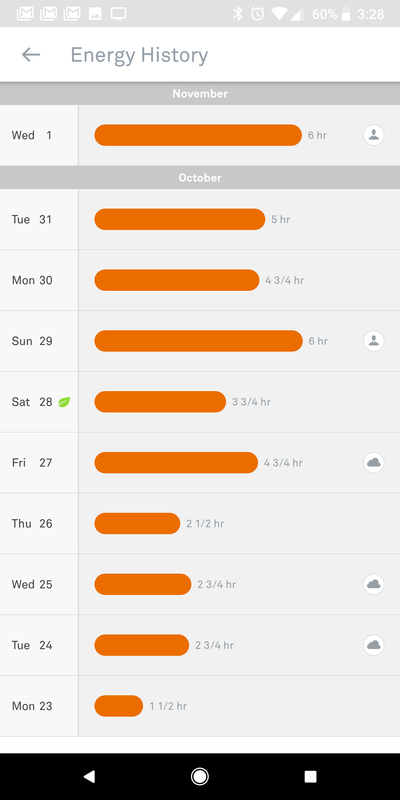 The default when Nest starts operating is for the energy usage to dip during the day when most people aren't home. This time of year, that means the thermostat sets itself to the low 60s so the furnace doesn't kick on as often. Of course, I had to change that manually the first few days. After that, the Nest figured out I'm at home all day and stopped dropping the temperature at 9AM. In the Nest app, you can control what your thermostat is up to in just a few taps. 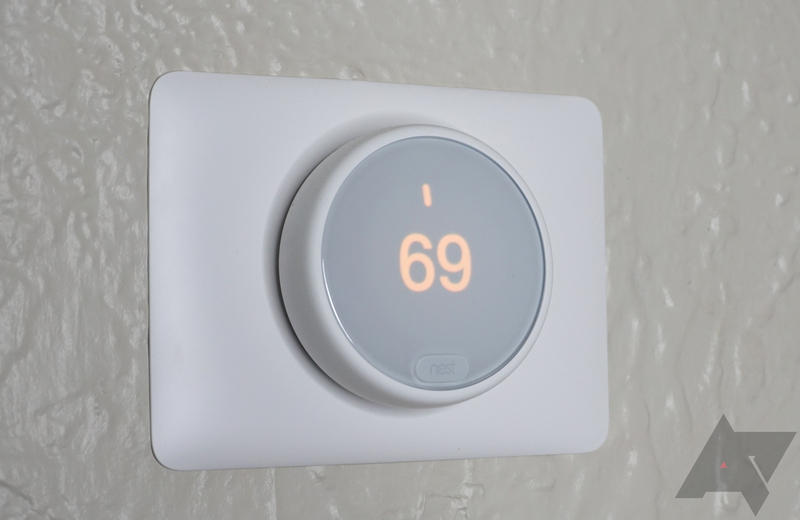 The thermostat interface is different for the E than it is for the regular Nest—it matches the aesthetic of the device itself with a light UI and big minimalist temperature display. 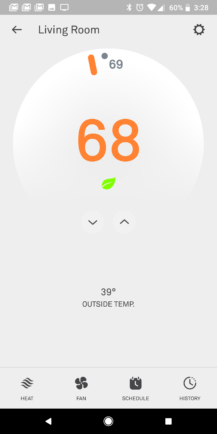 You can set the system to heat, cool, heat/cool, eco, and off from the app. For most people in most places, it'll be either heat or cool mode, but the combo mode is helpful if you happen to be in an area where there are wild temperature swings. Nest's home/away assist can shift your Thermostat E into eco mode (lower energy usage) when you're out. I had some issues with this feature at first, but I think that's mostly due to my circumstances. You can only have the location feature enabled on one phone per user, and I switch phones a lot. If I forget to enable the feature on the phone I'm actually carrying, home/away assist doesn't work. When I do remember, it works flawlessly. Nest plugs into Google Assistant, and there's very little setup needed to start controlling the Thermostat E by voice. Simply log into Nest via the Assistant settings and assign the Thermostat E to a room. With that done, I was able to ask Google about the temperature setting, change the temperature, and switch modes. Nest also understands more casual phrases like "make it warmer." Changes made via Assistant are relayed to the Nest almost instantly. The only qualm is that I can't figure out how to modify the temperature settings via Assistant when the system is in the combo heat/cool mode. I've been very pleased with the Nest Thermostat E, and a big part of that is I'm not constantly aware of it. A thermostat is something that just needs to work, and introducing "smart" features into formerly dumb devices can make them less reliable. That's not the case here. The Thermostat E does its thing, and I don't have to think about it unless I want to change something. When I do, the app and Assistant integration make it super-easy. Nest likes to talk about how much you'll save with a smart thermostat. I've been using the E for a full month in order to see what sort of savings I'd get. Based on my rough estimate, my energy bill is about $10 lower than I would have expected. We're not into the dead of winter yet, so I would not be surprised to see the monthly savings increase slightly as the furnace gets more use. The Nest Thermostat E is easy to install, feature-rich, reliable, and not too expensive. I would not hesitate to recommend it to anyone looking for a new thermostat.